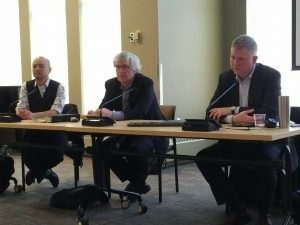 The WLUFA-organized round-table discussion titled “Zero Tolerance: Conflict Resolution, Harassment, and Toxicity in the University” answered a number of timely questions for the faculty and staff members in attendance yesterday. The panel, moderated by WLUFA President David Monod, included experts in the field of conflict resolution: Jesmen Mendoza of Ryerson University’s Faculty Association, Jim McDonald of Goldblatt Partners, and Michael Conlon, Executive Director of OCUFA. Each panelist provided an insightful look at workplace harassment and conflict resolution from a differing perspective. Mendoza outlined some of the reasons why workplace harassment occurs, as well as provided a sketch of departments that he considers models for maintaining positive relationships between members. Conlon provided a summation of the Steven Galloway (UBC) suit — a clear example of what can happen when a university fails to foster collegial relationships and/or protect its members from attack. McDonald provided the all-important legal background that served as a foundation for the entire discussion. It wasn’t all business, of course. Congratulations go to Kirsten Yri who won our door prize — a gift certificate from Gina’s Spa in Waterloo. WLUFA is pleased with the results of its first organized round-table and is hoping to provide similar future opportunities to bring information to our members.